I adore the Swoon Reads imprint and have made it my mission to read all of the books. I was especially excited for Surviving Adam Meade because the synopsis just exudes Friday Night Lights vibes! Claire Collins is ready to leave her new town before school even starts. She misses her old friends, boyfriend, and life that she had to leave behind when her dad took a new job as the head football coach in a small town in North Carolina. She especially doesn’t want to get involved with any more football players after her last boyfriend broke her heart. However, even though Claire gets off on the wrong foot with the quarterback, his best friends are the first to befriend her on the first day of her senior year of high school. Now she keeps being pushed together with the jerk that is Adam Meade, only to find out that he may not be as mean as he seems. What I really liked about Surviving Adam Meade was the setting. I loved the small town football feel and all of the fun Claire gets up to with her new friends—racing ATVs, playing night hide-and-seek, and spending a day on a boat in a lake. I also liked how applying for colleges and scholarships were actually a big part of Claire’s senior year (although the timeline did seem a little sped up). I also loved Claire’s relationships with her family and friendship with Riley, but I wish we had seen more from them! What I didn’t like as much was how jumpy the plot and timeline seemed to be. There was one point where a chapter ended and the next one picked up three weeks later. There just seemed to be details missing that needed to be there to connect everything. Honestly, Surviving Adam Meade could have been longer, which probably would have helped with the how fast it felt. Claire and Adam have their moments (some of which are really cute and filled with snarky banter), but again, it seemed like something was missing and I had trouble rooting for them as a couple. 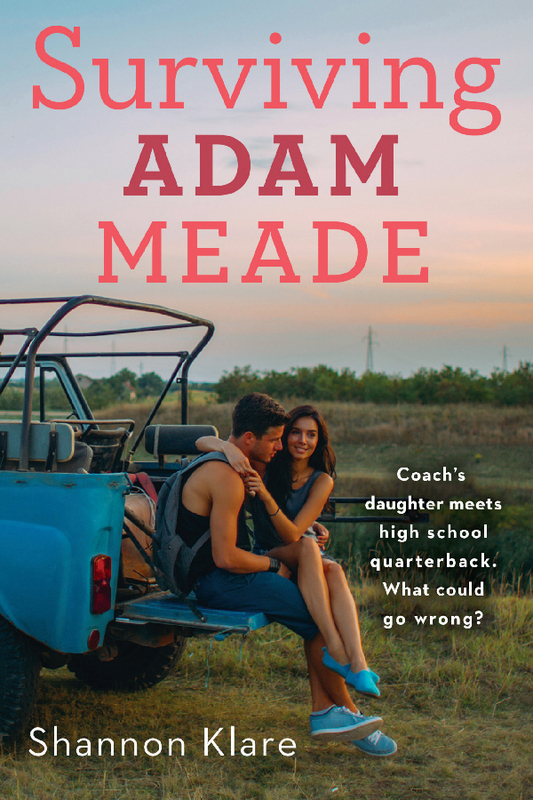 Overall, Surviving Adam Meade is a quick read filled with snarky banter, small town vibes, football, and senior year challenges. I am a total black sheep on this book, because I loved it. It actually got better and better for me and when Claire had that When Harry Met Sally Moment, I just was overjoyed. I honestly feel more like the black sheep on this one as I hear so much love for it! I didn’t hate it, I just didn’t love it like I was hoping I would. Thanks, Jenn! I love small town settings too!